Provide comfort for the family of Ruby Elizabeth Layne Billiter with a meaningful gesture of sympathy. 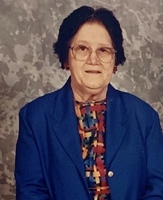 Ruby Elizabeth Kendrick Layne Billiter, age 90, of Pikeville, KY., passed away Wednesday, March 27, 2019. Ruby was born July 28, 1928 in Pike County, KY., to the late John and Bell Williamson Kendrick. In addition to her parents, Ruby was preceded in death by her first husband, John Paul Layne; her second husband, Willie Bee Billiter; two daughters; Margaret Ann Coleman, and Dorthy Mildred Layne; two great grandsons, Caleb Holton and Keegan Hunter Layne. Ruby is survived by one son, Paul Allen Layne, and his wife Anita; six grandchildren; Dawn Holton, Brad Layne, Kala Duffy, Sean Layne, Rose Ford, and Jean Hamilton; five great grandchildren, Clifford Ford, David Ford, Shane Ford, Jonathan Holton, Madison Layne and a host of brothers and sisters. Ruby was a loving mother, grandmother, great grandmother and a devoted member of the Pikeville Wesleyan Church. She will be forever treasured and greatly missed. The family will accept friends at Thacker Memorial Chapel, Saturday at 6:00 PM and all-day Sunday, March 30 and March 31, 2019; with services nightly at 7:00 PM. Funeral services will be Monday, April 1, 2019, starting at 1:00 PM at Thacker Memorial Chapel with burial following at the Annie E. Young Cemetery in Pikeville, KY. Arrangements are entrusted to Thacker Memorial Funeral Home. To send flowers in memory of Ruby Elizabeth Kendrick Layne Billiter (KENDRICK), please visit our Heartfelt Sympathies Store. We encourage you to share your most beloved memories of Ruby Elizabeth here, so that the family and other loved ones can always see it. You can upload cherished photographs, or share your favorite stories, and can even comment on those shared by others. Provide comfort for the family of Ruby Elizabeth Kendrick Layne Billiter (KENDRICK) by sending flowers.